What better way to bring in the new year than surrounded by luxury on the sun deck of a cruise ship? Here’s your chance to start 2019 the right way, in the “must-see European destination of the year”: Madeira, Portugal. From the 1st to 7th of October, bonuses and Madeira New Year Experiences will fall on the reels of selected CasinoEuro slots. All you have to do is to pick your favourite game and spin. The prizes for the first stop on CasinoEuro’s European Tour will fall on random spins, so even your first spin can win you this unique European experience! The trip to Madeira includes a Toboggan ride, a stay in a beautiful resort and best of all, a New Year cruise with the best views of the beautiful fireworks. Stuck on what to do in Madeira? CasinoEuro has picked five of their favourite places on this beautiful island that make for a great start to the new year. Create an account and start play! As part of your New Year’s trip you’ll be treated to an exhilarating ride in an old fashioned toboggan! This two-seater wicker basket slides down the 5 km hill with two men in rubber-soled boots acting as your real life human brakes! This 10 minute ride down from Monte is a must-do when in Madeira. This is a definite butterflies-in-the-stomach inducing ride as it reaches speeds up to 48 km per hour! Madeira is, among other things, the birth place of football superstar, Cristiano Ronaldo! So, for the football fans among you, the CR7 Museum is sure to be a treat. This small museum has all things Ronaldo, from letters to jerseys and statues. There’s even an augmented reality section for those who want to take a picture with the football star himself! Known as the tallest lighthouse in Portugal, the Ponta do Pargo lighthouse offers breathtaking views of Madeira’s coastline. Though it’s actually only 46 feet tall, which is nothing next to the tallest lighthouse in the world, the size of the cliff its resting on makes the light itself one of the highest in the world. When in Madeira, why not stop by Nuns Valley and its adjacent area? This beautiful natural valley is home to a small isolated village and just a short trip from where Churchill spent some time painting whilst visiting Portugal. The top of the valley is also said to have one of the best panoramic views in Madeira! CasinoEuro recommends stopping in the Nuns Valley village for a taste of some of the famous chestnuts! Porto Do Moniz is famous for its natural swimming pools that were formed by volcanic rocks and is often a favoured swimming spot during the summer. After stopping by, why not head to Fort São João Baptista, which once protected Porto Moniz from pirates and now serves as the island’s Aquarium? 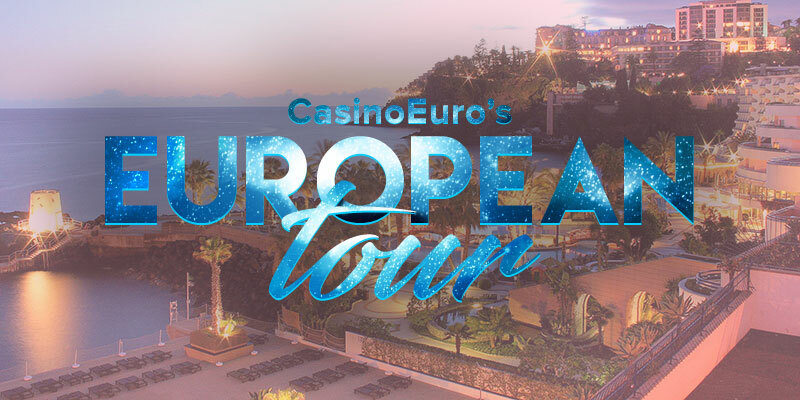 So there you have it, that’s the first stop on CasinoEuro’s European Tour, which all in all offers 10 stops, 10 unique European experiences and 10 chances to win. You could be the one to wander along the hills of Nuns Valley or speeding down the winding streets in a Toboggan when you play on CasinoEuro’s selected slots. Even just a single spin on the reels could be enough for you to hit the New Year’s Jackpot. Where to next?